Is your teenage student struggling to get motivated? Are you having a difficult time bringing out the ambition and creativity that you know exist? It’s all of our faults. Well, let’s start by diving into the science behind motivation to gain a better understanding of what it actually is. In 1998, Columbia University’s Claudia M. Mueller and Carol S Dweck did a study on 128 fifth-graders. The 128 fifth graders were asked to complete a series of difficult puzzles. Students were then invited to work on three more puzzles of varying difficulty. This is what happened. “Worked hard” students chose to work on the harder problems. “Must be smart” students chose to work on the easier problems. “Worked hard” students exhibited Internal LOC = Higher motivation levels for students. “Must be smart” students exhibited External LOC = Lower motivational levels for students. The “smart” students believed intelligence was innate, and therefore, out of their individual control. Internal locus of control or Internal LOC is the scientific term for individuals who believe they are responsible for their own success in life. This self-responsibility results in higher motivational levels and greater productivity. Those with an external locus of control or External LOC believe that external forces, like luck or the schooling system, determine their outcomes. This lack of self-responsibility results in lower motivational levels and productivity. Not believing you have control over the situation can hinder your motivation levels. The “No Child Left Behind” act and common core. Teachers have no room to allow students to think creatively or solve problems on their own since they are required to follow a step-by-step standardized curriculum. Student’s are constantly reminded they are not in control. In fact, I witnessed this first hand when a teacher assigns a research paper on topic “XYZ” to the class. Should the paper be 400 words or 450 words? Should it be double spaced or single space? Is it ok that I write it on topic “XYZ” or do you prefer topic “ABC”? I don’t know about you but this scares the S**T out of me!! By the way, I hardly ever swear. But this post NEEDS IT! Our Economy Is Moving Toward a Freelance Economy. Students Need To Be The CEO’s Of Their Own Lives In Order To Thrive! Due to the internet, and other advancements in technology, massive industries have been disrupted left and right, and globalization has continued to rise as jobs get outsourced to low-cost employees in India or Malasia. Corporations like Intel and LinkedIn have started to even hire their workforce as 2-year contractors, rather than employees since it allows them to be agile in making quicker business decisions needed to compete in this fast-paced competitive economy. Yet, as we inevitably move toward this new way of life, our education system has not made the necessary adjustments and is teaching like we’re still in the Industrial Age. No wonder students are graduating with the average of $37,172 in debt and 51% of them are not even using their degree. They don’t know how to get motivated, take control, and creatively solve problems; because all they have been taught in school is how to take orders and go along with the status quo. I had the opportunity to speak with the superintendent of Peoria school districts Dr. Darwin Stiffler, where I presented this finding. He stated they are well aware of the problem and are in the midst of fixing it. In fact, you might have even seen this problem presented in the news or the motivational problem in Forbes. Redesign of the traditional classroom from CNBC. However, this process can be slow and tedious, while the new job market and skills needed to thrive are quickly changing. By the time schools make the adjustments, your student will be long gone! So what can you do today to ensure your student has a bright future? As I mentioned above, students that believe they are in control of the situation exhibit internal LOC or higher motivational levels. Therefore, have them create some goals for themselves so they “believe” they are in control. Don’t worry about what the goals are! They can be anything. Heck, it could be to win a video game! When creating goals, make sure they are S.M.A.R.T and you take value vs. effort into account. Many times individuals create goals that require a lot of effort and provide very little value to the end goal. Figure out what the end objective is in 5-years, then 1-year, and finally develop a goal the student can work toward over the next 3 months that aligns with their 1-year goal. Here is a slide from class # 2 that I teach in my Student-Tutor mastermind program with students from across the world! You will be amazed at how simply creating goals that your student cares about will magically create higher motivational levels in your teenager! Step 2: Create a weekly habit to measure progress. Praise their efforts, not traits. I know your student is smart. In fact, I don’t think I’ve talked to a parent yet that states their student is NOT smart. …but please stop telling them they are! Remember the case study about the 128 5th graders? You are doing more damage to their motivation levels than good! Instead, create a weekly habit to have what we like to call a ROPER session where you renew, organize, prioritize, execute, and reflect on a weekly basis. Afterward, congratulate them on the progress they have made toward their goals. 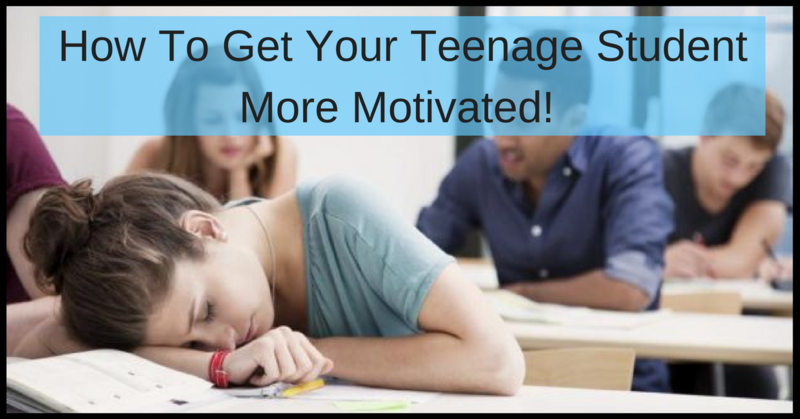 You will once again be amazed by the motivation levels that begin to appear for your teenager! I love my ROPER sessions I have with the Student-Tutor mastermind students every Wednesday. Below is a graph I use in class # 3 I teach to the students. Watch this video to see what some of the students have to say! Step 3: Ensure your student is surrounded by individuals that are doing the same! This is the final but most important step to ensure your teenage student boosts their motivation levels and develops the skills needed to thrive in the digital age! When you are surrounded by motivated individuals with big dreams and goals, your goals don’t seem that outlandish anymore. In fact, they seem manageable and that support system allows you to reach them! Let’s not forget the quote from Henry Ford. Or, don’t find them a mentor or community and unfortunately they are going to be surrounded by students who are following the “status quo,” filling in bubbles on a scantron, and developing an external locus of control or lower motivational levels that will hinder their abilities to be truly successful in this new era that we live in. I invite you to check out our Student-Tutor mastermind program where we solve this problem for you! Our schooling system is more standardized than ever, and it’s creating an external locus of control or lower motivational levels in students. Our economy is quickly moving towards a freelance economy and becoming more globalized. Our education system understands the problem and is trying to fix it but by the time they do, it will most likely be too late for your student. Follow these 3 steps to ensure your teenage student knows how to get motivated and creatively solve problems on their own. Have your student create goals that require them to creatively figure out the solution. Create a weekly habit to measure progress. Praise efforts, not traits. Ensure your student is surrounded by individuals that are doing the same. What do you think? Would you like your student to work one on one with me and other teenagers from across the world? Join our mastermind community where we bring together motivated ambitious teenagers from across the world to set and achieve goals while learning digital age skills that are necessary to be successful in this era. Click here to learn about the Student-Tutor Mastermind program!